Weather apps have always confused me—why look at an app to see whether it's raining? Just go outside and see for yourself! The Visibility app, while a really innovative idea, is another puzzling one. Surely you can recognize if there's a high concentrate of smog in the atmosphere? Or even if you can't, why would you need to know? What would you do about it, if your Android app warned you of the high level of air pollution one day? Stay indoors? Stop using deodorant? Regardless of all that, the app does use an astounding amount of technology to verify the presence of smog. 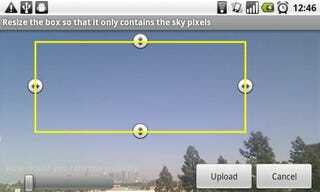 Developed by the University of Southern California's Viterbi School of Engineering, the user simply has to take a photo of the sky (narrowing the section down to trim out buildings/trees/passing birds choking from the air pollution), and then it's sent automatically along with the GPS, compass, accelerometer and clock data to a central computer for analyzing.